After two phases of voting across two months, the competition committees for the Overwatch World Cup have been finalized. Each includes a general manager, coach, and a community lead, who will collectively make decisions regarding each national team’s roster, management, and promotion. Work for these committees begins immediately, with roster tryouts beginning on June 1. 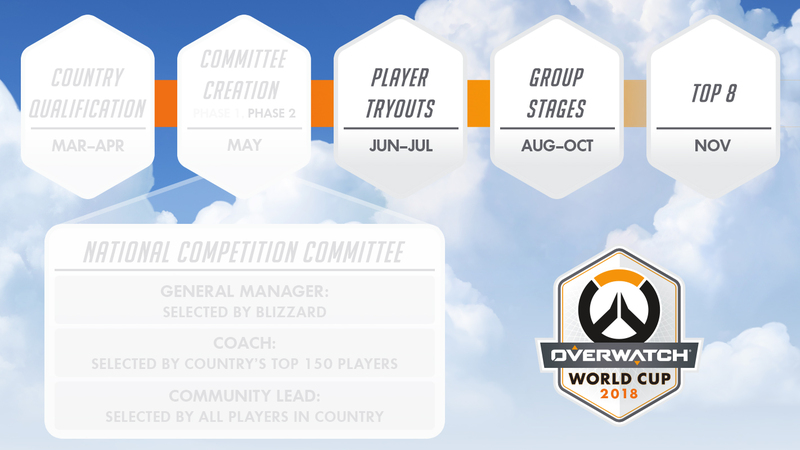 Rosters must be submitted to Blizzard between June 15 and July 5. Committees are empowered to reveal their own rosters and build the hype for their communities, so keep an eye on social media for new team accounts and announcements! Keep the Overwatch World Cup official site bookmarked, and be sure to follow @PlayOverwatch and @owpathtopro on Twitter for upcoming group stage venue and ticket information.